I attached some pictures of the buck I harvested in eastern Minnesota on Oct. 30, 2018 at 12:10 p.m. This buck had been seen on camera on Oct. 19 in the dark checking scrapes and had also been captured on Oct. 23 in broad daylight. These recent sightings had given area hunters a ton of confidence that they could get crack at this trophy. In hunting camp, we had five guys whose dream it had been to put Hollywood in the back of their truck for the trip home; I was one of those hunters. Another hunter had spotted this buck the previous hunting season, but he’d been just out of range and couldn’t close the deal. Hollywood had survived the rest of the archery season and more crucially the Minnesota gun season. A young man on a neighboring property was fortunate enough to find both sides of Hollywood’s shed antlers that following winter. Barring a crazy accident, we knew Hollywood would be around the next hunting season for us to pursue via Mark Schuh from Schuhters OutPost. I was the fourth guy in the rotation to sit this particular stand and to target this elusive buck. So Tuesday, Oct. 30 finally came around and I was on the stand taking my turn. After seeing the rutting activity in the middle of the morning that mild morning, things slowed down a bit. The clock struck noon, and nature was calling. But something told me that even though it was mid-day and activity was quiet, I needed to stay put. I sat back down after eating a snack and relaxed. Five minutes had passed when I turned around and looked down the bluff where I had seen the previously mentioned 9-pointer harassing a doe earlier. To my surprise I spotted a large-bodied deer about 70 to 80 yards down the hill. I popped back up to my feet and pulled up my Swarovskis for a better look. At first glance he was behind some brush but he clearly was a good buck. When he emerged from behind some brush I immediately recognized him as Hollywood. I couldn’t believe my eyes and I was instantly in a panic thinking about how I could turn this magnificent creature around and get him close enough for a shot with my compound. Unfortunately after he was done trying to show his dominance to this intruder buck, he turned his head and was on his way again. In total desperation mode, I grabbed my doe estrous can and tipped it a couple of times to see if I could change his mind. This time he didn’t even take a glance as he moved away from me. Setting the can down, I tried my snort wheeze a second time and hammered it as loudly as possible. At this point Hollywood was feeling threatened and needed to find out what buck wanted a piece of him so he made a hard right turn to start walking up the steep embankment toward my location. I gathered my thoughts and fervently clipped my release on my bow and waited for him to close the distance. It didn’t take him long, and before I knew it, he was at 24 yards behind some brush. Looking ahead of him, I saw an opening for a clean, ethical shot. I raised my bow and come to full draw. Hollywood walked parallel to me but was in some brush that prevented a clean shot. He passed through a small opening and I decided not to release. He walked a few more steps, then turned 90 degrees and was heading right at me and emerged out of the brush at 20 yards. With him now facing me head on, I had no ethical shot because of the extreme angle due to the treestand height and slope upon which he stood. After only a step or two he turned and headed back into the brushy area. As he was turning, I gave him the known “murmp” when he was broadside in his turning motion, then I put bright fiber optic dot behind his shoulder and released my arrow. I instantly saw the wound where the arrow entered this beast as he spun to dash away. He ran back down the hill to where he first appeared and headed in the direction he was originally heading. As I watched him head away, I was anticipating him getting the wobbles and dropping based on my observation of the entrance wound placement. But to my surprise, he walked out of sight still on his feet. I immediately called Schuh and told him the news and heard him celebrating on the other end of the phone. He shared my story two other hunters who had come in for lunch. I told him what I observed after the shot and he said he felt confident and that we would give him a couple hours. After some time passed, I descended to look for my arrow and to see if there was blood where the arrow struck the buck. I could not recover my arrow but did find bright red blood that contained small air bubbles. I continued to see spots of blood and then noticed some of the blood had small pieces of corn it. My heart sank as I immediately started questioning my shot: Had I hit stomach or intestines? I returned to my treestand and waited to hear from Mark. After calling my step dad (who introduced me to hunting) and a close friend to ask for their prayers that this once-in-a-lifetime whitetail buck would go down without suffering and that we’d recover him, I sat with wavering emotions. I came to tears thinking about recovering this buck and how blessed I was to lay eyes on such a creature much less get an opportunity to harvest him. As two or so hours passed I climbed back down the treestand and met up with Mark and the other hunters. We discussed the situation and decided to let another two hours pass before we start on the blood trail. After the grueling two hours, we headed back into the woods to my stand. We had been following the blood for roughly 15 yards when we recovered the arrow, which had been a pass through but must have stayed in this beast for a bit before it fell out. The arrow looked good so we continued on discovering somewhat spotty blood. After we went another 40 yards following the blood we observed an improving blood trail. That boosted our emotions as Mark led the way. Suddenly Mark stopped, turned around, and pointed ahead with a fist pump. I could not contain my emotions any longer and broke down crying before I even laid eyes on him. 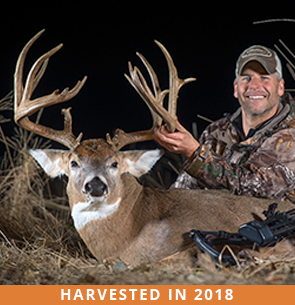 I was so thankful God had allowed me this opportunity, and I held it together to harvest an absolute buck of a lifetime. After I pulled it together we all walked up to Hollywood and I placed my hands on him. I thanked him for his life and for the opportunity. And the celebration began.